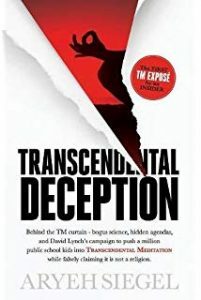 Transcendental Deception: Behind the TM Curtain—Bogus Science, Hidden Agendas, and David Lynch’s Campaign to Push a Million Public School Kids into Transcendental Meditation While Falsely Claiming It Is Not a Religion. By Aryeh Siegel. Los Angeles, CA: Janreg Press. 2018.ISBN 978-0-9996615-0-5. 222 pp. Paperback, $17.99. The subtitle indicates the content of this well-researched yet straightforward response to the quasi-religious sect founded after 1955 by Maharishi Mahesh Yogi (1918–2008). Mahesh first taught his religion as “transcendental deep meditation” in India. Later, this savvy businessman trademarked Transcendental Meditation (TM) for foreign consumption. A major meditation cult was born: Cultus means to care for; TMers care for themselves and the world through a special meditation technique. Before I get into my review of the text, I want to relate an anecdote of my encounter with an average TM user in Santa Fe, New Mexico, decades ago. I was in the French Pastry Shop of the La Fonda Hotel reading an article critical of Transcendental Meditation. The headline caught the interest of a man in his thirties who sat at a table behind me. He was nicely attired in a sport coat without a tie. He told me that he was in town as a sales rep for a small business. Without any prompt from me, he launched into defending his TM practice that has helped him to become a success and kept him feeling well for eight years.